During my last purchase there, I was gifted with a free for nothing note card which advertised the manner of greeting that he favors when approaching others. This haunts me. Quite the way to prompt a head scratching review of personal behavior. In the same short space of time, I was privy to a televised message from Jon R. Roebuck of Belmont University. It piled onto Littleton’s message. My church does not lead with the message of Lenten sacrifice. I never regretted this because, like Jon Roebuck, I observed others chatting it up on the sacrificial lamb of soft drinks, for heaven’s sake. These shenanigans never floated my renewal boat. During this Lenten season, via the above stream of consciousness, I’ve challenged the ways I fallen short to the world and myself. I began with a desire for pure presence, that is, full living on the muffet-tuffet where I find myself ensconced. While there, I notice the gnarly head of impatience and it shrivels my little-girl soul. Daily I spy the knotted face of angst which has been my cross to bear. I now believe the irritated response has floated down unconsciously from ancestors. I’m stopping that funny business by adopting a winning headspace for a personal Lenten practice which will dissolve knee-jerk impatience. Observation of present day shepherds has furthered the cause. It is a morality play of sorts – a picture inside a picture. It happened during an after-party for Lemuria Bookstore http://lemuriabooks.com staff at the home of proprietors Mel and John Evans. 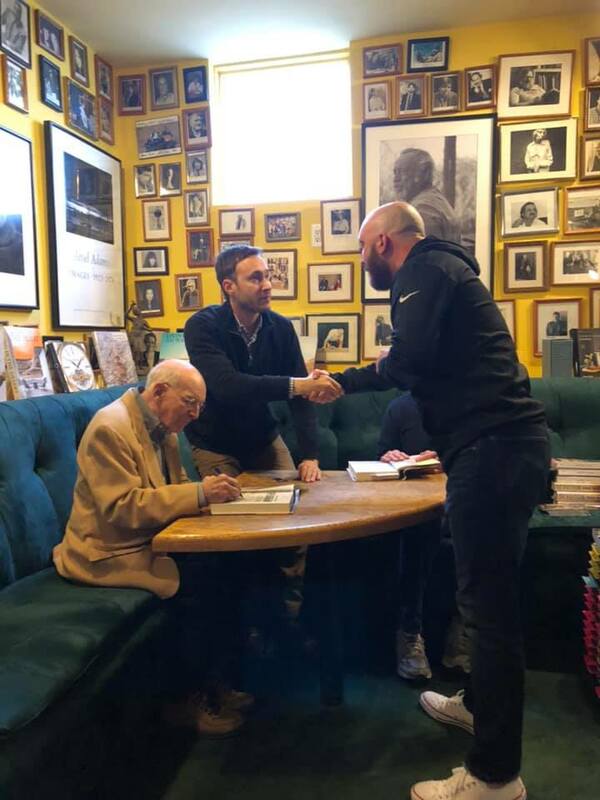 Earlier that evening, John hosted a reading for World War II author Adam Makos and 3rd Armored Division soldier Buck Marsh for Makos’s most recent work of nonfiction entitled Spearhead. The two have been fast companions for the past few years in the telling of Spearhead. The decades of world experience could easily have kept them apart. Buck is a splendid 95 and not the average bear. Adam is a thirty-something old soul. Buck’s wife advised that Adam’s sensitive patience to wages of war allowed Buck’s telling of the story. Readers are all better for the book which now enjoys fourth place on the New York Times Nonfiction Best Seller list. Watching their exchange and chatting with the two, I sensed the possibility of gently settling into where others are or have been. Could it be the situation that challenges our departure from where we are comfortable is the very path that produces the most glory? Out with annoyance, anxiety, fretfulness, edginess, agitation, intolerance, irritability and rashy ants in my pants. On with the exquisite exchange of patience and unexpected teachers who set an example. Mel Evans is a favorite cook of mine. She is not scared. I have known her to research and prepare the exotic just for the wow factor of it all. She prepared this easy salad recipe for the book signing after-party. The combo was quite a trendsetter back when Jackson Jr. League’s Come On In was published in 1991. It’s a keeper since it can be prepared ahead of time and can serve 10 or more. Combine broccoli, cauliflower, onion, cheese and bacon. In a separate bowl, blend mayonnaise, sugar, and vendor and mix well. Pour dressing over all, toss, and chill several hours before using.